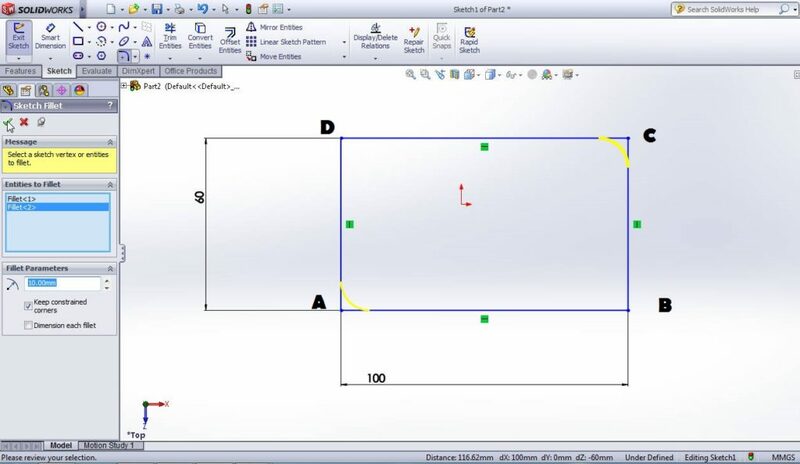 Do you want to make curved corner on your sketch entities in Solidworks? Then Sketch fillet tool is useful tool for you. It is mainly used to round the corner at the intersection between two sketch entities. While creating round corners, it automatically creates two tangent arc at the filleted sketch. In this tutorial you are going to see how to use Sketch Fillet tool and its property manager. Note: This is just tutorial showing how to use sketch fillet tool, not showing any product drawing or designing in it. If you are advanced SolidWorks user please avoid it. This Solidworks tutorial is for beginners, students or people likes to learn about SolidWorks. For the understanding of this tutorial I simply make Rectangle “ABCD” of dimension 100 in length and 60 in width (100x60mm). You need to fillet the four corners of rectangle. Corner A & C of fillet radius = 10 mm and Corner B & D = 20 mm. Select the “Sketch Fillet” tool from the command manager by clicking on the button. Go to “Tools” menu and from the drop down menu select “Sketch Tools”. From the side drop down menu select “Sketch Fillet” by clicking on it. 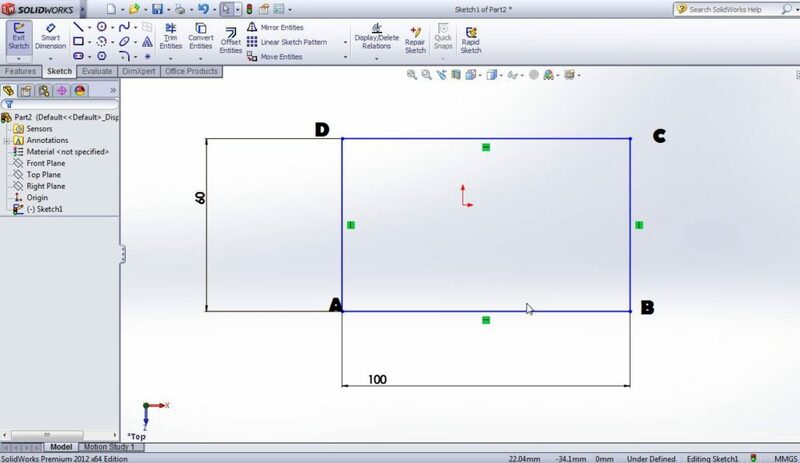 Then select the Vertex or corner ‘A’ of the rectangle or select the AB and AD lines. Then an automatic fillet preview is available on the sketch interface. From the property manager you can enter fillet radius, here radius = 10 mm, at both corner A and C. Then click on the Green Tick (OK) button. Then it is look like in the image shown below. Again repeat the process at corners B and D. Set the fillet radius is 20 mm. Then the filleted rectangle as per our dimension is shown like in the image above. Entities to Fillet: This section you select the sketch entities to make radius fillet. It may a vertex or two intersecting lines. Fillet Parameters: in this section you can enter the radius of the fillet. Here you can constrain the corners and add dimension to each fillet option. Note: The fillet option is also available in Features toolbar in the solidworks command manager. Thank you for reading this SolidWorks Tutorials and feel free to share your honest opinions via comments.